Since he first attracted attention a few years ago as a promising young tenor saxophonist with the Jazz Couriers Tubby Hayes has become an accomplished performer on several other instruments. He has formed and run a successful quartet, made an LP under his own name and during this time has been steadily increasing the power and range of his musicianship. He has recently formed a new quintet which has taken the job of resident group at the Ronnie Scott Club. 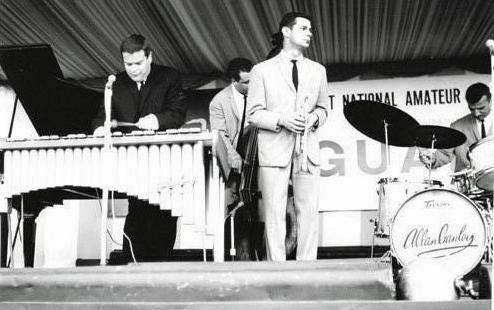 Tubby Hayes explains the new quintet: I felt I was getting stale writing for the quartet. Everything was going well, I learnt a lot from it, but I'd been with the quartet for two and a half years and we all needed a change. I wanted to play beside another horn, and the extra instrument means more scope in the writing without tempting you to overarrange; I wanted to spread out a bit and make writing easier. The members of the group were chosen where possible for their breadth of experience and all except pianist Gordon Beck are well known. Jimmy Deuchar played trumpet with the old Dankworth Seven, and was more recently trumpeter and co-leader of the Scott-Deuchar Quintet. Allan Ganley grew up with the bands of Jack Parnell, Ambrose and Johnny Dankworth and has been leading his own group for the last two years. Freddie Logan (bass) came to England from Holland in 1953, at the age of 21, emigrated to Australia in 1956 and started his own band there. Tubby Hayes tenor style was drawn from Ronnie Scott and Stan Getz and matured in the footsteps of Sonny Rollins; it is obvious that he has been listening very carefully to John Coltrane recently. In trying to investigate the rhythmic and harmonic advances Coltrane has made over the past two or three years, he has set himself a formidable task and perhaps unwittingly has undermined his own purpose. In the first place the rhythm section does not seem quite able to cope with the most advanced arrangements; moreover it is in playing just such advanced pieces that a limitation becomes apparent in Hayes' own technique: his phrasing is not suited to the stark and fragmented line implicit in modern musical thinking, having still a good deal in common with the gentler and more verbose style of his earliest influences. It must be allowed that the group has not yet had time to settle down properly and develop a group style, and that anyway the sounds never fail to be interesting; but this hiatus between style and technique is a persistant fault during the more advanced numbers. It is in the swinging bop numbers of less adventurous structure that Tubby really comes into his own, when he can relax and let his fluent line and virile tone do the work, no progress being made here, fewer surprises, and who wants them if the alternative is such a joy to listen to? And it is in these relaxed moments, when he is really blowing and not concentrating on producing unfamiliar music, that he sometimes sounds almost like Coltrane for a phrase or two; here and there he begins a chorus with a phrase of piercing attack very much in the Coltrane idiom, only to revert after a few notes to his normal '50s bop style. Jimmy Deuchar's incisive trumpet tone and brittle lines can build up musical tension with breathtaking speed and facility, but he is a diffident soloist, sometimes to the point of flippancy; he seldom seems to retain interest in what he is playing for much longer than is needed to build the tension up. And then, as often as not, he will rudely sabotage it with a cliche or deliberate sour note, or coldbloodedly dismantle it with a reversal of his opening information. At best his playing is both sardonic and driving, and thoughtfully used could provide valuable support and stimulation for other soloists; it will be interesting to see how much playing with Hayes will increase the stamina and evenness of his style. That he has the ability is evident when, playing muted trumpet beside Hayes on vibes, he plays with a controlled sweetness that complements the pensive sound of the vibraharp, producing music of a finish and balance rare in British jazz. These pieces lack the inconsistencies of the horn duets, but they also lack their spasmodic intensity. Allan Ganley provides adequate rhythm most of the time, but his beat is a little too rigid and inflexible for the more ambitious numbers. Gordon Beck's solo style is very individual, sometimes hesitant and cerebral, sometimes lyrical and impulsive. His sophisticated sense of rhythm well suits him for what Tubby is trying to do. When he becomes more sure of himself he will contribute a great deal to the cohesiveness of the group by using his sensitivity to create a common ground for the two horns. He has plenty to say and does no repeat himself in long solos. The musical fare provided by this group will never be monotonous. Hayes has purchased a soprano sax to add to his flute, vibes and tenor. The purchase was made after he wrote a tune called In The Night which he thought would sound better on soprano. He said a little defensively, that Coltrane's adoption of the instrument had nothing to do with his own, as he does not like Coltrane's sopranos style. With such a ball of fire for its leader and such proficient musicians this group cannot fail to produce jazz of a consistently high standard. It is not unrealistic to hope that continued assimilation of modern influences will bind the member's styles together and shape them into a truly individual group style. The quintet broke up in 1964 and when asked for the reason why Tubby explained: To be quite honest I had felt for some time that we were getting into a rut. I found the musical approach of the quintet was inhibiting my own musical development. Without wishing to jump on the 'avant-garde' band wagon, I sought a freer approach to my music. Fortunately the group made a number of recordings and these are now widely regarded as some of the finest British hard bop ever recorded.available on CD. With all the attention upon Tubby's work, it is all too easy to overlook Deuchar's contribution, but these records abound in fine moments from the trumpeter's hard hitting style on the title track of Down In The Village, his Harmon mute lead on Angel Eyes on Late Spot At Scott's, his glowing lyricism on All Of You from Tribute To Tubbs and his mellophonium on the skating 6/4 blues Simple Waltz on Night and Day. Deuchar's composing figured prominently also in the Hayes quintet's book; First Eleven, a torturously complex theme which reveals that Deuchar had been listening to Giant Steps-era Coltrane, is one of the high spots of Down In The Village, while the graceful If You Knew, which opens Live In London volume 2, is a theme so inevitable that it seems to have been around for years. Tubby Hayes (ts,ss,vib), Jimmy Deuchar (tp), Gordon Beck (p), Freddie Logan (b), Allan Ganley (d). New Edition*/My Man's Gone Now*/Cool*/In The Night*/Quota*. Tubby Hayes (ts,vib), Jimmy Deuchar (tp), Gordon Beck (p), Freddie Logan (b), Allan Ganley (d). Half A Sawbuck*/Angel Eyes*/The Sausage Scraper*/My Man's Gone Now*/Yeah*/Quintet Theme*. Johnny One Note*/But Beautiful*/The Most Beautiful Girl In The World*/Quintet Theme*/Down In The Village*/In The Night*/First Eleven*/Quintet Theme*. Tubby Hayes (ts,vib-2), Jimmy Deuchar (tp), Gordon Beck (p), Freddie Logan (b), Allan Ganley (d). This page was last updated during December, 2015.